An unusually warm spring meant extended time on the water for a fisherman, resulting in fewer hours in the field for a hunter. When you indulge in both hobbies, you’re still left with one turkey tag left to fill by mid-May, and late season hunting can be tough. I had filled two tags the opening week of spring turkey. With a few short yelps, the unsuspecting Toms came barging in to challenge my Dave Smith jake decoy. However, as the season progresses, they get educated, more wary. Calls become less effective, and patience is tested. I spent many mornings and evenings in the blind, calling once an hour hoping to catch a lonely Tom off guard. The morning of May 14th was no different. As I laced up my boots, and loaded my pack, the weight of that unfilled tag was heavier than my gear. 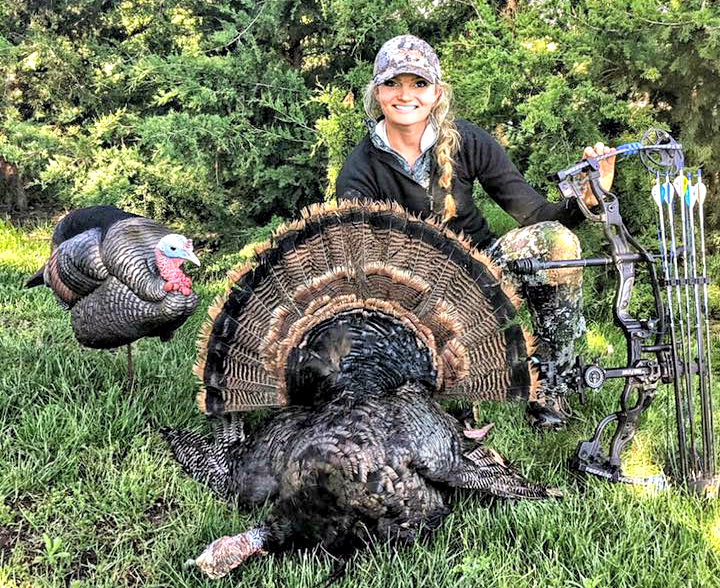 The season was drawing to an end, and I vowed to stay off the water until I got my bird. I chose to hunt a property I hadn’t hunted yet this year, a small farm east of the river. A muddy corn field with a large brush pile in the corner showed several signs of gobblers in the area. My boots sank into the soft mud, and I could hear the woods begin to come alive as I unloaded my pack, and strategically set my decoys. I tucked my blind into the brush pile, and set my jake and one feeding hen fifteen yards out. As dawn crept across the field, I made my way into the blind to wait. I nocked an arrow as I let out a soft call. In the distance, I heard the sound that lights a fire in the hearts of hunters across the globe… “GOBBLE!” He’s here. Careful not to rush him, I put my diaphragm call back into the case, and set my bow across my lap. It was 6:12 am, a good 15 minutes before the sun would rise. I intently scanned the field and the tree line. A few minutes passed as I debated whether or not to call again. As I reached for my coffee thermos, something moved in the corner of my eye. I looked out and saw what appeared to be a hen walking directly across my set up, in the tall grass towards the corner I was tucked away in. I squinted to get a better look, as it was a good 100 yards out. I noticed the bird zone in on my decoy, and saw the head turn a bright red color. It was my tom. My heart started to race and he came directly towards my jake. I slowly positioned myself and started to draw my bow. I felt the cams roll over and felt the familiar thud of the back wall, and the string buried into my cheek. The tom was about 20 yards out and coming in hot. I rested the pad of my index finger on the release, and the bird stopped as if he could feel my 20 yard pin on his chest. He flared, and started to turn back towards the woods. This was my chance. This could be the last bird I see of the year, and he would be my biggest. He was about 30 yards out and walking at an angle away from my blind, a tough shot with my bow, but one I had practiced many times before. I put my pin right ahead of the wing, took a long breath, and sent that arrow flying. THUMP. I hit my mark. The tom jumped into the air, and feathers flew as he ran 10 yards and dropped. I dropped my bow and buried my head in my hands. I had filled my last tag. The sun finally started to make its debut as I made my way back across the field with my blind and decoys on my back, and my bird and bow in my hand. The past few mornings I didn’t see anything but a cottontail. Late season can be brutal, but just like any day in the woods, things can escalate quickly if you’re willing to put in the time and the effort.